There are 22 articles in this month. The individual PDF articles published in January 2015 are collected here in a single download. On Episode 366 of CrossFit Radio, host Justin Judkins interviewed Jennie and Bill Yundt of CrossFit Fire, as well as CrossFit Jackson owner Jayson Keel. This episode was webcast on Jan. 28, 2015. In these chilly winter months, nothing hits the spot like a bowl of hearty chili. Nick Massie of PaleoNick.com brings us this simple recipe to warm your soul—and your belly. “Nothing says ‘warm me up’ like a bowl of my chipotle chili with butternut squash and bison,” Massie says. Certification and Licensure: Benefit or Liability? 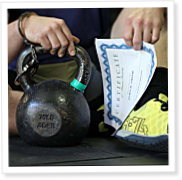 Lon Kilgore reviews recent legislation affecting personal trainers and discusses what it might mean for CrossFit trainers and affiliate owners. In 2014, Washington, D.C., passed legislation giving the D.C. Board of Physical Therapy regulatory authority over fitness professionals, who also had to register with the mayor’s office in order to practice. 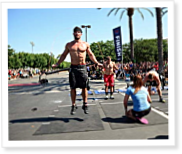 On Episode 365 of CrossFit Radio, host Justin Judkins interviewed Dave Castro, Director of the CrossFit Games. This episode was webcast on Jan. 21, 2015. In 2001, one of Robin Moore’s friends pointed out he doesn’t usually see people who are overweight live into their 70s or 80s. “This little bell went off in my head, because at the time I weighed 430 lb.,” says Moore, who also has diabetes. Chef Nick Massie shows us how to create a simple, delicious and balanced one-pot meal: chuck-wagon brisket pot roast. “We’re going to enter the Zone once again with this super-simple slow-cooker pot roast,” says Massie, who runs PaleoNick.com. To get started, you’ll need turnips, carrots, onions, celery, chicken stock, salt, pepper, Italian seasoning, granulated garlic and beef brisket.